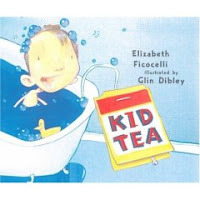 Kid Tea by Elizabeth Ficocelli, illustrated by Glin Dibley. 2007. Copy provided by publisher, Marshall Cavendish Children. What, you may ask, is "kid tea"? Place a dirty child in a bathtub; and that's your kid tea! Playing in the dirt: brown kid tea. Eating a purple Popsicle? Purple kid tea. The week ends with Sunday, a visit to church, and two kids saying "Dunk me in the tub, please." What color? "Look -- no kid tea! We can be clean for one day . . . "
This works as both a cute book (kids do something, kids get dirty, kids clean up) and a concept book about colors. Peter Parker zoomed in on this one. Loved the colors, loved pointing out the colors. Loved that there is a brother and sister, doing things that they do. This is a good pre-reading book; it's easy for him to memorize, and to identify the colors and then for us to find the word for that color. The Poetry Friday round up is at Big A little a.
I loved this book too!! And yes, I plan to use it a few different ways in story hour - it's a good one!! I liked Kid Tea, too... However, when I read it in storytime, some of the parents became offended. Maybe they were over-thinking it?